Surprised by the mild start to December? Perhaps the average person was, but clients who subscribe to WeatherWorks Long Range Forecast products were anything but! Beginning back in mid-late October, long-range meteorologists here at WeatherWorks began to key in on atmospheric signs that the first month of meteorological winter had a good chance to start off on a warm note. This was a particularly gutsy call considering that November ended up averaging well below normal across most of the Mid-Atlantic and Northeast. While some may have thought this trend would continue into December, this turned out not to be the case. Temperatures across the entire nation are currently running up to ten or more degrees above normal for the month, with virtually no areas of below normal departures. As you can see, one of our long range products dating back to November 1st predicted this correctly. WeatherWorks official forecast (refer to attached image) called for milder than normal temperatures for nearly three-quarters of the nation during the December 1 – 15th timeframe. 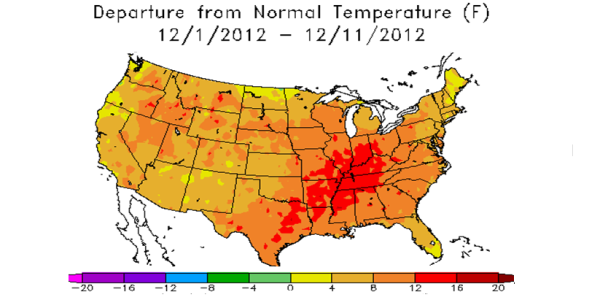 Additionally, no areas were forecast to see below normal readings during that same period. 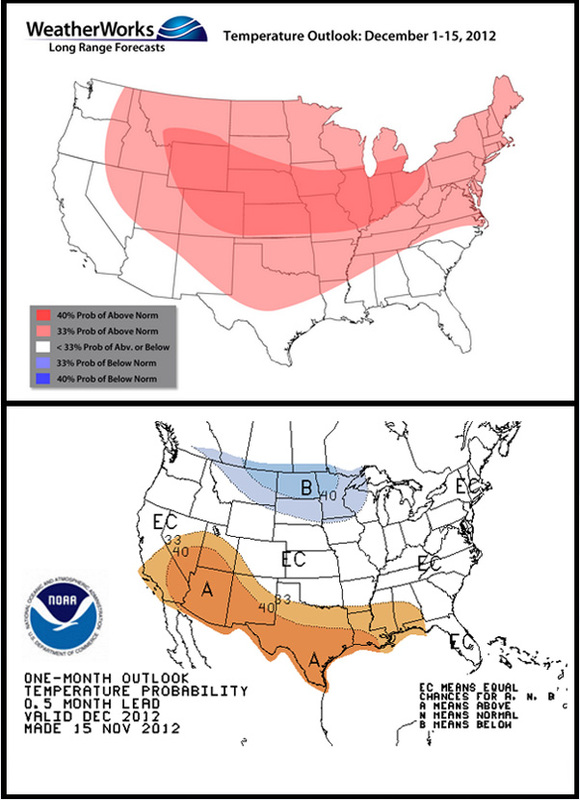 By contrast, a forecast issued by the Climate Prediction Center (part of NOAA) valid for the same time period, issued on the same date called for a vast majority of the nation to see near normal temperatures, with even colder than average conditions across the Northern Plains and Upper-Midwest. Would your company benefit from this kind of knowledge one to two months in advance? With January and February still on the horizon, wouldn't it be beneficial to have a competitive edge on the latest long range weather trends? Contact Kevin Hopler (kevinhopler@weatherworksinc.com) to upgrade your service today! In addition to our suite of long range forecast products, WeatherWorks offers a Winter Risk Product, which is specifically designed for the snow and ice industry. Aside from temperature and precipitation analysis, this product provides a detailed look at snowfall departures for a future period. This is just one aspect of our Winter Risk Product, as other facets actually break down “threat type” on a weekly basis (see attached image). Do you prepare differently for a minor salting event than you would for a major snowstorm expected to produce over 6 inches of snow? If so, Winter Risk is the product for you…as our meteorologists break down a general risk for each type of threat on a weekly basis up to one month in the future. This medium-range preparation tool is a perfect complement to our long range products, and when used together can take most of the guess work out of your strategic decision-making!